PLEASE SHARE SCREENSHOTS OF YOUR SPEEDTEST RESULTS on your EVO 4G LTE! Bonus brownie points for results from side-by-side speedtests on EVO 4G LTE with previous EVO models or Galaxy SIII or iPhone 4S. I want to see how this phone is working for others, and how it compares to other options. I'm seeing such horribly low signal that the phone is barely useable much of the time. 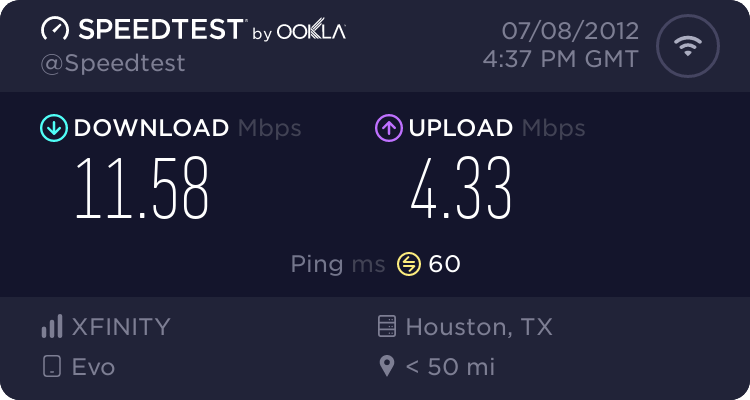 I've read many threads with similar issues in these and other forums, so now would like to see SpeedTest results. I think that will be interesting to others as well. I need to either find a fix (going back to store today) or find a much better option. 1) Phone model (and carrier if different than Sprint). 2) Screenshot(s) of results from SpeedTest.net app or website. To take a screenshot on the EVO LTE, press the power button and home button at the same time. The photo is saved to the phone storage under DCIM if you try to find it using a file explorer. EVO 4G LTE. My worst results - download speed LESS THAN DIALUP!!! EVO 4G LTE. My best results - still pathetic. Thanks for any screenshots posted. I haven't been using Speedtest until just now so don't have a lot of data yet. I had been using Open Sky Maps and best results I saw were 1.7Mb download and just under 1Mb upload. Here a test for every 1 HTC LTE EVO first 3 are sitting in my livingroom The next 2 are with there airave hooked up 1 at it the other 20 feet away and of course the last 2 are on WI FI so dang close to telling SPRINT good by and hello Verizon this is stupid for what i am paying . I just got my evo lte. I an consistently getting 200 or less in the mpls area and northern suburbs. I have turned off the lte in the settings. As a comparison I have also tried my daughters evo 3d at the same time and location...she gets 900++ on every test. Are you running the same server for the test? It seems that I get different results with different servers. That is a big discrepancey between phones. I have never had fast 3g in my area and non peek test I only get around 700K download. Peek hours run from 50K- 300K. 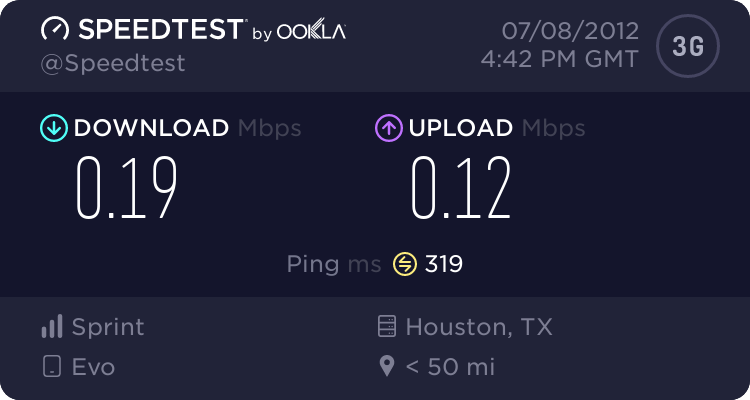 I have tried nearly every server speedtest offers to me. When I do the side by side tests with the evo 3d, I make sure they both are on the same server. the evo 3d is constantly 4-5x faster with the 3g speeds. That shouldn't be. I figured out how to take screen shots..... Today I can't crack 100kbs!!!!! And I have nearly FULL BARS! After over a week of terrible speeds and signal problems, replacing with a second new HTC EVO 4G LTE, and hours and hours of frustration, I decided the problem was partly the poor signal reception on that specific phone, and partly that Sprint just doesn't provide good cell service in this area (and misrepresents that to me and other customers). The Sprint technician who looked at my first EVO LTE phone said the logs showed 30% of my calls were not completing successfully on the EVO LTE. Not sure if he meant internet activities as well as phone calls and texts, but I do know that I was having waaaaay to many problems with basic activities. The second replacement phone was no better. After talking with neighbors, I changed to Verizon yesterday. FANTASTIC signal!!! Went from 26k (as in half the speed of dialup!) - 300k on Sprint HTC EVO 4G LTE to 4200 - 8500k on Verizon Droid Razr. No slowdowns, no dropped calls, no delayed txts, no skips and lags on streaming audio and video, no disconnects on facebook, just phones and broadband modem that WORK! Wooooohoooooo! Price ends up same as I was spending with Sprint for phones and usb modem that have been slow and troublesome for years. Wish I'd switched years ago. The Verizon people were nice and especially helpful when they saw my speedtests from the EVO LTE... they offered to allow me to try any phones I wanted with free (no restocking fee) return if they didn't perform as needed. I'm going to check out HTC phones on Verizon today and see if they work as well as the Droid Razr. I like the features of the EVO LTE, just not the terrible signal problems. HTC EVO 4G LTE on Sprint .... downloads often under 100k, seldom (if ever?) over 300k at my home and office. DROID RAZR on Verizon .... so far, never under 3500k and saw over 8600k yesterday evening. I'm FINALLY seeing the broadband speeds I've been paying for at Sprint but have never received. Good luck to all of you with the HTC EVO LTE. I still say it would be a fantastic phone if it got good reception, but if you travel or don't live in the areas with the very best reception, you will probably be in for a lot of frustrations. Dude, while 26 kbps down is pathetic, you're comparing Verizon 4G with Sprint 3G. That's apples to oranges. I Might as well post my 35+Mbs bandwidth scores I get when I turn on wi-fi. Can you run speed test using 3g on your droid? I assume it will be much better than 26kbps, but no where near 3500k. I agree with Mr-homer, can you run the speed test on Verizon 3G and post your results? Also did you ever update your PRL on your EVO LTE, it seems like you are fairly hung up on the one test result of 26kbps....and seeing that you joined here 3 days ago was just curious what troubleshooting you may have tried? Personally I haven't seen 3G speeds much lower than 1Mb/s and my last test was about 1.8Mb/s. And while I wouldn't ever try streaming audio and video at 26kbps, I would be curious how quickly you ran into data overage charges on Verizon if you're doing that with any regularity.